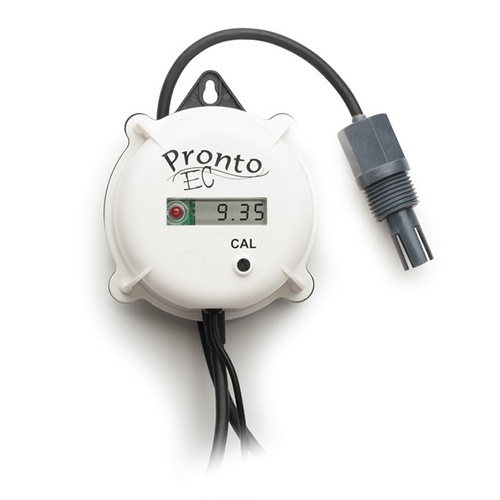 The Pronto EC Meter HI983304 is a water resistant conductivity meter designed specifically for demineralization and deionization applications. With a user selectable setpoint and visual LED alarm system, you can now measure EC with peace of mind. Engineered especially for applications involving demineralized and deionized water, the HI983304 is a simple way to measure EC. You can simply hang the meter right above the output of any demineralization system to be tested for continuous measurement and the unit will run without interruption on 12 VDC power supply or take it with you for spot checks. The built-in visual alarm will activate when any measured value differs from the set point by 1.00 µS/cm. This exclusive feature will ensure maximum system efficiency with minimum investment. The meter housing is rated IP54 meaning it has a high level of protection against particles and a fair amount of protection against water. The integrated large LCD allows for an easy reading from a distance and can measure with great accuracy up to 19.00 µS/cm. The meters are supplied with a HI7631 probe that automatically compensates for any temperature variation. The HI7631 is a two-pole amperometric EC probe for with a built-in temperature sensor for Automatic Temperature Compensation and a ½” male NPT threaded connection for insertion mounting. The polyethylenimine (PEI) protective sleeve resists most aggressive chemicals.The HI7631 probe provides a rapid response and high accuracy EC measurement. EC Calibration HI983304 does not need calibration when used in pure water applications. Ordering Information HI983304 is supplied with HI7631 EC probe, calibration screwdriver, 12 VDC power adapter and instruction manual.